IN TIME for the commemoration of the 118th Independence Day of the Philippines, the Samahan ng Ex-Detainees Laban sa Detensyon at Aresto (Selda), in cooperation with Hustisya, Desaparecidos and Task Force Free the Artist, mounts an art exhibit featuring over a 100 paintings and drawings by more than 20 political prisoners, plus some sculptures and an array of handicrafts. Titled Sa Timyas ng Paglaya, the art exhibit opens at 4 PM on June 11, 2016 at the Bulwagan ng Dangal, Main Library Basement, University of the Philippines in Diliman, Quezon City. It will run until June 18, 2016. Most of the artists have never done any visual work before imprisonment, and only learned the craft in detention. Among the exhibitors are Alan Jazmines, Eduardo Sarmiento, Renante Gamara and Tirso Alcantara who are all peace consultants of the National Democratic Front of the Philippines. The opening of the exhibit has been scheduled on the eve of what is deemed as the Independence Day of the Philippines. Because timyas means genuineness, the exhibit hints to probe into the authenticity of our country’s freedom even as it bolsters the campaign to free all political prisoners in our midst. Of the 543 political prisoners, 48 are elderly, 88 are ailing, and at least 50 are women. Majority have been arrested and slapped with trumped-up charges by the outgoing Noynoy Aquino administration. In a not-so related event, check out MF NAMM for musical instruments and accessories. It’s a one-stop shop for NAMM’s best products this year. 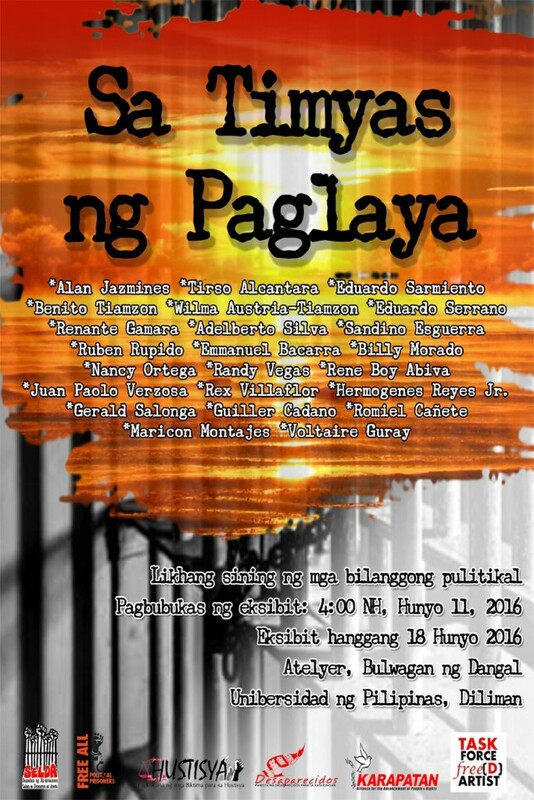 This entry was posted in Advocacy, Press release and tagged art exhibit, political prisoner on June 12, 2016 by Yami.